This rare and panoramic one of a kind parcel offers one of the very best unobstructed and expansive mountain views in Eagles Nest. It’s building enveloped provides for backyard and pool area privacy which allows these amazing and desirable views to be enjoyed from the rear of the house thus making the home design more livable. The terrain offers the advantage of minimal site preparation costs. This is a great combination of features when compared to other similar parcels that have much higher prep costs in the subdivision. Directions: Palisades to Eagle Mountain Blvd, through the gate, continue straight, left to Mountain Parkway, left to White Wing Ct, first parcel to the right. Fountain Hills’ only private 18-hole championship course offers stunning mountain views and tremendous native vegetation, making it one of the most picturesque courses in the Valley and a top Eagles Nest golf option. Enjoy elevated tees, raised greens and challenging approach shots. As the course winds around mountain views, each hole presents a unique challenge, governed by its own set of circumstances. The clubhouse features casual and fine dining experiences, a fitness center, pro shop and member lounge; tennis and swimming pool are also on-site. Par 72. Desert Canyon Golf Club (formerly Fountain Hills Golf Club) is a lovely, expansive, 18-hole championship course that offers wide fairways on both hilly and flat terrain, weaving around beautiful homes with splendid mountain views at almost every turn. A traditional clubhouse offers beverages and casual dining. In addition, DC Bar & Grill serves incredible views along with their scrumptious meals for a fine-dining event you won’t forget! Par 71. Named to “Top 50 Public Course’s In The Country” 2009 by Golf World; “Best of Phoenix Public Golf Courses” in 2006 by the Phoenix New Times; and “#1 Public Golf Course” Ranking Arizona, 2006 – 2007, the course weaves through the box canyons amid sweeping vistas of the valley of the sun and nearby mountain ranges. Clubhouse offers casual dining and The Southwest Inn is a delightful luxury boutique hotel experience. Par 71. SunRidge Canyon’s 6,823-yard Keith Foster-designed golf course unfolds around the rugged ridges and shady canyons unique to the desert mountains that divide Fountain Hills from Scottsdale, Arizona. The golf course gradually descends on the way out before doubling back to climb up the slope on the way in. This subtle elevation change lies at the heart of the dramatic golf experience at SunRidge Canyon. After a challenging day of golf, enjoy the Wicked 6 Bar & Grill, named for a portion of the golf course that provides a particularly difficult challenge. Par 71. We-Ko-Pa (Yavapai for “Four Peaks”) is a daily fee golf facility that consists of two spectacular 18-hole layouts that are certain to challenge and inspire golfers of all levels. Featured in numerous publications including Golfweek, and named one of the “Top 10 Best New Courses You Can Play” in the United States 2007. There’s a 10,000-square-foot clubhouse, restaurant, golf shop and several lounge areas. Both courses Par 71. Hiking is a relaxing, invigorating pastime for locals, and Eagles Nest is conveniently close to some of the best hiking options near Phoenix real estate developments. From the expansive, awe-inspiring mountain views, to the intimate appreciation of native wildlife and Sonoran Desert terrain, Fountain Hills and the adjoining Scottsdale trails offer hikers of all abilities an abundance of trails and experiences. Thanks to the foresight of local residents, the tops of the McDowell Mountains are preserved for wildlife and future generations to enjoy. Through the work of Sonoran Conservancy volunteers, there are now more than five miles of trails. Call to discuss guided tours being offered from Oct. 22 through April 5. The regional park, bordering Eagles Nest on the north, is a 21,000-acre park with over 40 miles of hiking, mountain biking and horseback riding trails, as well as camping and picnic opportunities. 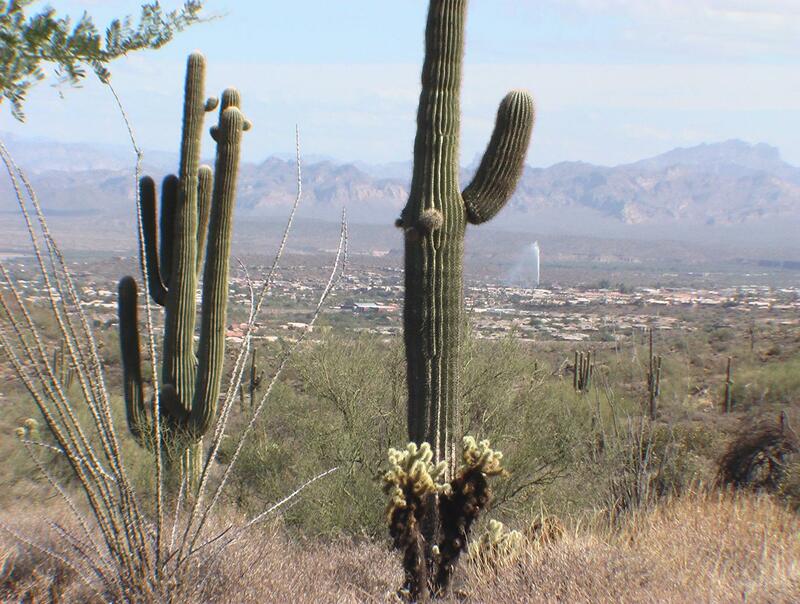 The Lake Overlook Trail is an easy-moderate 1.5-mile hike that is accessible from the heart of downtown Fountain Hills and offers outstanding views of the Town and the neighboring Fort McDowell Yavapai Nation and surrounding mountains. The south trailhead is located at Panorama Blvd. between Vista Del Lago and Diamante Drive. The north trail head is located at Panorama Blvd. just east of Saguaro Blvd. The Avenue of the Fountains is the perfect “stroll, wine and dine” venue, attracting more than 400,000 visitors to our two “Great Fairs” with more than 450 juried vendors. On Thursdays from October to April, the Fountain Hills Market boasts 80 unique vendors with hand-made food, art and gift items. It is where the town “Trick or Treats” and where we gather to sing carols and welcome the holiday season. Created as a welcoming oasis in the Sonoran Desert, the Fountain Hills area is a historical and cultural hub of the East Valley. The Verde and Salt Rivers nurtured the Hohokam people and the ancient Yavapai; then Mexican and Anglo explorers, soldiers and ranchers paved the way for area development that includes Fountain Hills, the Fort McDowell Yavapai Nation, the Verdes Communities and Goldfield Ranch. The Community Center is a prime example of the public/private partnership tradition in Fountain Hills. Combining the fundraising efforts of service clubs, individuals, and Municipal resources, the complex is home to a classic Event and Exhibition Center, the Senior Activities Center, classrooms for Parks and Recreation activities for all ages, the Maricopa County Branch Library/Book Store, the River of Time Museum, and the Centennial Circle Outdoor Event Plaza. 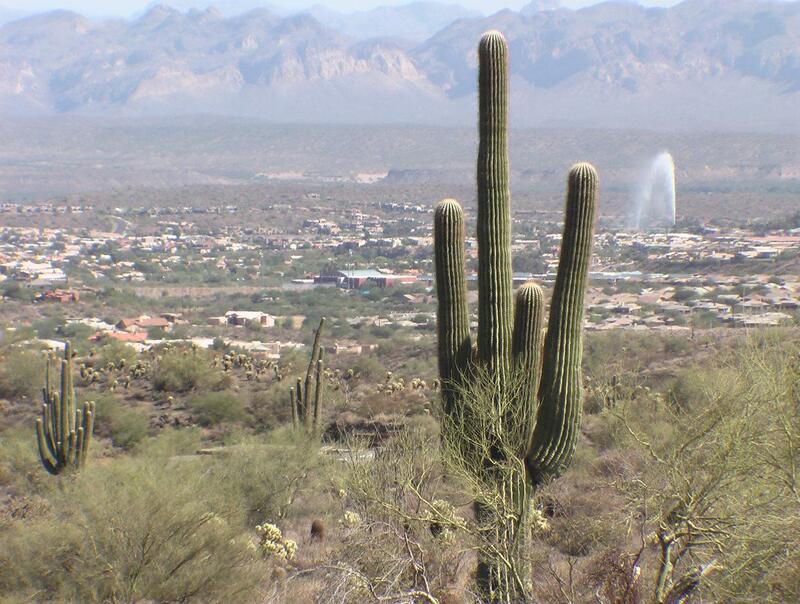 The Fort McDowell Yavapai Nation, the Town of Fountain Hills and Chamber of Commerce have formed the only Visitor’s Bureau partnership of its kind in the country. “The Fort,” led for decades by economist Dr. Clinton Pattea, has developed significant resources for tribal members, including agriculture, construction materials, healthcare and education, and recreation: WeKoPa Golf, the classic WeKoPa Hotel, Casino, and the genuine western equestrian venue, Fort McDowell Adventures. Locally, Fountain Hills has a collection of boutique shopping experiences to tempt the most discriminating shopper. From high fashion at Fountain Fashions, to local fine art at the Fountain Hills Artists’ Gallery, to handmade chocolates at Chocofin Chocolatier, there’s a wealth of interesting treasures you won’t find anywhere else, all conveniently close to Eagles Nest, the premier Scottsdale Arizona real estate development. A shopping experience like no other, Scottsdale Fashion Square offers a 250-store-strong awe-inspiring mix of some of the country’s most upscale shops. Neiman Marcus, Nordstrom, Dillard’s, and Macy’s join Gucci, Ferragamo, Cartier, Bottega Veneta, Jimmy Choo, Hugo Boss, Juicy Couture and more. Quaint city districts where charming streetscapes are lined with unique storefronts and cafes make up the Scottsdale Quarter, where you’ll find an eclectic mix of retail brands against a backdrop of mid-rise contemporary buildings, old-world architecture and lush desert landscape. A broad array of iconic retailers – many opening in Arizona for the first time – provides shoppers with choices and selection unmatched in the Valley. Sports bar/grill offering a hefty pub fare menu, 30+ TVs & weekend live music, plus a patio. Fountain Hills, a reminder to Marco, and his son Gaetano Cacace, of their home in Sorrento, Italy, features signature and traditional Italian dishes; and also a variety of new and exciting modern Italian fare. They are known for their fine Italian cuisine. CopperWynd’s signature restaurant features deliciously healthful selections. The chef uses fresh, local ingredients in an artful atmosphere. Floor-to-ceiling glass panels slide open to reveal breathtaking views of the sunset on the mountain vistas and the Sonoran Desert. A sprawling patio offers additional outdoor seating for the wine bar and restaurant. Colorful, folk art–filled Latin American eatery with tapas, bruschetta, sangria & outdoor seating. Narrow, brick-lined bistro with sushi bar seating for sashimi, maki & Japanese kitchen entrees. Pancakes of every fashion, delicious traditional breakfast and a grilled cheese lovers place to be for a great lunch. Informal, family-friendly bar & grill offering a wide American menu, TVs & frequent entertainment. Elevated Mexican classics are served amid rustic-chic decor at this family-run restaurant. Outpost of a local chain turning out Mexican grub from morning to night in a counter-serve setup. Grapeables, consistently chosen as one of the “Best Bars/Wine Bars” in the Valley by the New Times, is your total wine destination, specializing in low production, boutique wines from around the globe. With over 200 wines to choose from you can either take a bottle home or enjoy it in our comfortable lounge or outside on the patio to take in the breathtaking view of the fountain, the lake, the park and Four Peaks. Upbeat spot with gourmet coffee, smoothies, pastries & breakfast sandwiches, plus a lakefront patio. Relaxing cafe crafting fine handmade chocolates, cakes, brownies & cookies. One of Arizona’s most popular icons and certainly the most famous among Scottsdale real estate developments, the world famous Tallest Fountain will become your time clock at the top of each hour, becoming more mesmerizing each day! Enjoy one of the many celebrated art festivals hosted along Avenue of the Fountains, try the finest wines at the Thunderbird Art & Wine Festival, or stop by one of the Avenue Galleries & Shops featuring celebrated local and national artists. Performing arts at the Lakeside Village Amphitheater are as varied—and grand—as your imagination. Treat the kids to a “Movie in the Grass,” marvel at Ballet Under the Stars, catch the Bard himself at Shakespeare Live, applaud your neighbors of the Fountain Hills Community Theater (Arizona’s most honored community theater! ), or listen to the melodious sounds of musical performances by Arizona’s finest entertainers. On weekends, drop in at Grapeables Fine Wines to enjoy live entertainment and cultural delights. Embark on an artistic journey…. and never leave your neighborhood! The Fountain Hills public art collection is a wonderfully eclectic experience that celebrates artistic excellence ranging from contemporary sculpture to traditional bronzes and everything in between. Nearly 70 selections valued at over $1.4 million grace the Avenue of the Fountains, Fountain Park, Plaza Waterfront and the Community Center Complex. The Fountain Hills Veterans Memorial is one of Arizona’s most beautiful and serene tributes to the men and women of the United States Armed forces. The Phoenix metro area is home to six professional sports franchises and home to a robust spring training program for Major League Baseball. This Eagles Nest land has panoramic 360 degree hilltop pad site. A full acre of spectacular viewing of the entire hills and mountains and this lot has minimal building site prep. Eagles Nest has a private exclusive gated community that a luxury home site of this caliber demands. 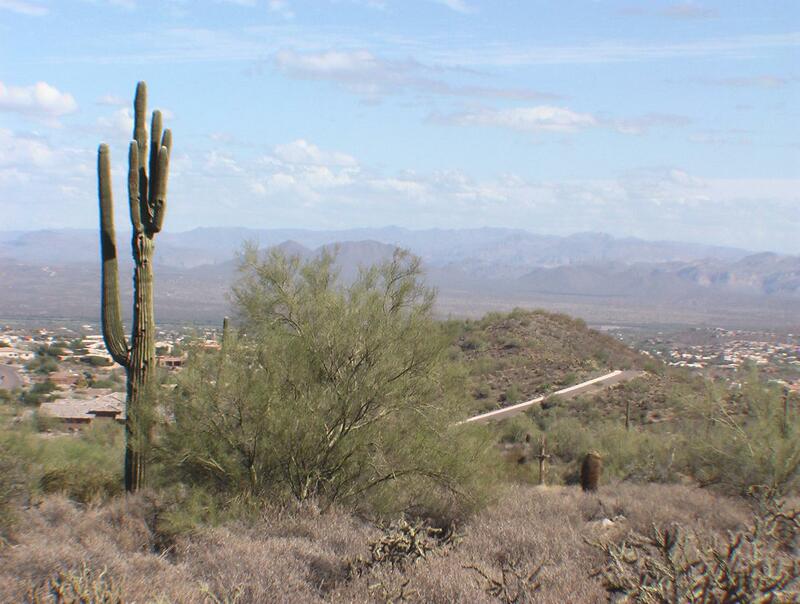 SPECTACULAR VIEW LAND IN FOUNTAIN HILLS ARIZONA FOR SALE- LOT one of the most scenic view acre lots in fountain Hills is now available in the exclusive Eagle nest gated community. 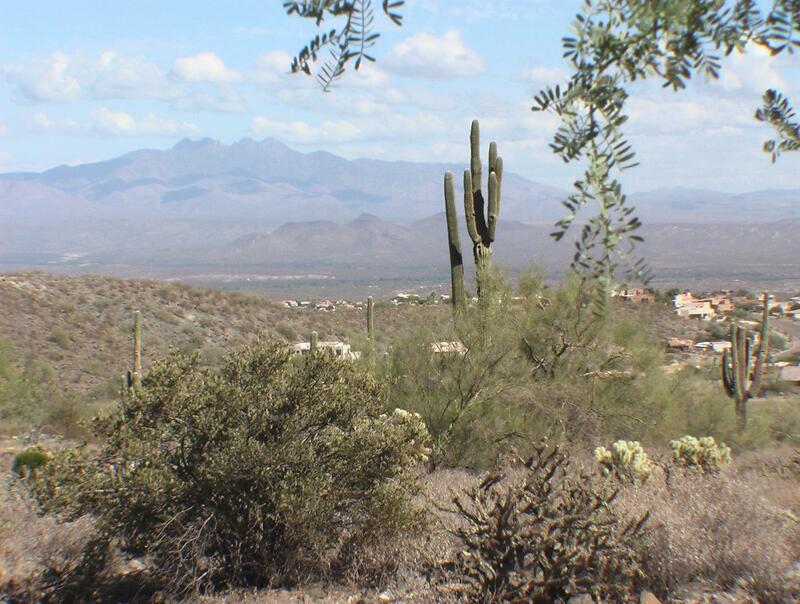 This land is situated next the McDowell mountains that surround the fountain hills land on the west side with unbelievable views to the north and east.